You can deploy your next web-based, intranet line of business application in Azure using a combination of Azure virtual machines and an Azure cross-premises virtual network. Create an Azure virtual network with multiple subnets for each tier of your application using a portion of your on-premises private address space. Connect the Azure virtual network to your on-premises network with a site-to-site VPN connection or ExpressRoute. Create the resource groups, availability sets, storage accounts, and load balancers for the virtual machines in each tier of the LOB application. Create and configure the servers used for identity and authentication for your LOB application. 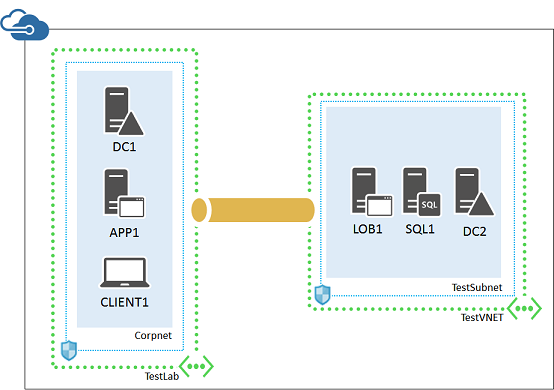 Create and configure the database servers for your LOB application. Create and configure the web and other servers for your LOB application. Two Windows Server Active Directory (AD) domain controllers for identity and authentication. A Windows Server cluster and SQL Server AlwaysOn Availability Groups for the database tier. An internal load balancer to distribute incoming connections to two web servers. For a different perspective and an explanation of how it works for intranet users, see the Line of Business Applications architecture blueprint.